Hello Stampers! How's your week going? Mine is going good. 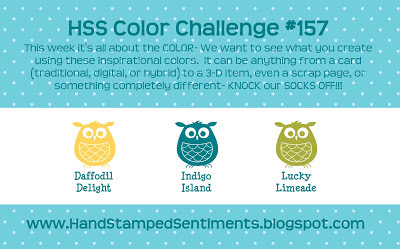 I came across another blog challenge this week that I wanted to try out. 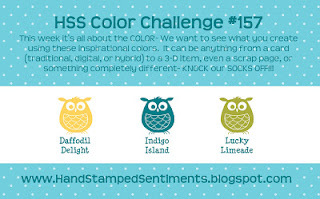 There are so many cool ideas at the Hand Stamped Sentiments blog to inspire you using these three colors. You can check out them out here. I had this idea in my head for awhile now and I am so excited with how it came out!! I used the Oh, Whale! stamp set from the current spring catalog to create a penny spinner card. Oh my goodness, the whale is super, duper cute! And when you use it with the Happy Whale clearlit die, easy! Have you created a card using the penny spinner technique before? Using the DSP with the waves from the Sunshine & Sprinkles DSP worked out perfect for my card. The butterfly stamp from A Fitting Occasion is small and detailed enough to not overwhelm the card. I couldn't resist using the googly eyes from the past Holiday catalog. I inked the sentiment in lucky limeade. Well I better get going friends. Thanks for stopping by. Until next time. Thanks so much for sharing you amazing talent with us at HSS!! Thanks so much for your comment Erin! What a great card you created! Thanks for the great color challenge. Love your work! Such a cute card! Love that you made a spinner card for the whale. Clever idea! Thanks for joining us this week at HSS. What a cool card!! Photos definitely don't do this fun, interactive card justice. :) Love the embossing and the added googlie eye on the whale. Too cute!! Thanks for joining us at HSS!